Making sushi is a lot easier that it seems. The real key to well-presented sushi is having good utensils, such as a sushi mat and a sharp knife. Each ingredient can be prepped in advance and assembled when you're ready to serve, and when you make it at home, it's a fraction of the cost! Though there are many wonderful forms of traditional makizushi, or rolled sushi, feel free to experiment with the ingredients you have on hand. I got my inspiration for the sushi pictured above from ingredients native to California; I used Hass avocados, goat cheese and baby Persian cucumbers. I wrapped these ingredients in the traditional combination of nori sheets and Japanese rice. 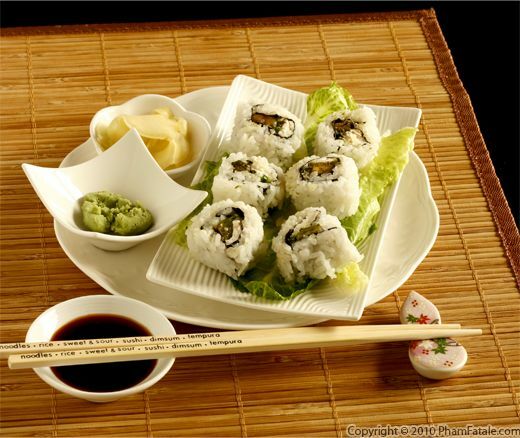 In standard California roll fashion, the rice is on the outside of the nori. If you've ever wondered why this is the case, the story goes that Japanese immigrants who came to the US turned the sushi inside out to hide the nori from culinarily unadventurous Americans. I don't know if that's true, but it's the story a sushi chef told me once. It certainly is a great tale! I served the sushi rolls with wasabi paste, homemade pickled ginger and soy sauce. It may seem daunting, but a sushi dinner is really as easy as 1-2-3. Sinh tố bơ is a Vietnamese-style avocado milk shake. In Vietnamese, avocado is called trái bơ, which literally translates to "butter fruit". The name is quite appropriate for this drink, which is sinfully rich. I take heart, no pun intended, in the fact that avocados are so nutritious and are loaded with the healthy kind of fat.